The National Institutes of Health is investigating whether a dozen researchers there failed to report taking funding from foreign governments, specifically China. Sen. Charles Grassley, a Republican from Iowa, last month requested the NIH Inspector General's office investigate "threats posed by foreign actors seeking to steal U.S. intellectual property by exploiting U.S. research institutions and the vetting processes in place regarding researchers and public grants [supported] by taxpayer-funded research." "The threats to our academic institutions from foreign governments are well known," Grassley wrote. "Our government must take all reasonable and necessary steps to protect the integrity of taxpayer-funded research." Sen. Chuck Grassley, R-Iowa, speaks during a news conference on Capitol Hill. Grassley inquired about the background checks of the researchers conducted by the FBI, as well, asking if "federal law enforcement has taken to educate various government agencies and institutions of higher learning about the threat and a history of investigatory and prosecutorial steps taken by the department in the last five years." The senator pointed to testimony in December 2018 from Justice Department witness John Demers, who testified that some "researchers in labs, universities, and the defense industrial base … may have undisclosed ties to Chinese institutions and conflicted loyalties." ​In February 2018, FBI Director Christopher Wray testified before the Senate Select Committee on Intelligence about worldwide threats that the Chinese are "exploiting" and "taking advantage" of our academic institutions. The same month, Florida Republican Sen. Marco Rubio wrote to four Florida universities imploring them to sever their relationship with "Confucius Institutes," or language and cultural programs sponsored by the Chinese government, and in the past few years, accused of spreading Chinese propaganda. "There is mounting concern about the Chinese government's increasingly aggressive attempts to use Confucius Institutes ... to influence foreign academic institutions, and critical analysis of China's past history and present policies," Rubio wrote. ​Several educational institutions have severed ties with "Confucius Institutes" in their countries, including France, Japan, Germany, Canada and Australia. In 2014, the American Association of University Professors (AAUP) published a statement titled "Confucius Institutes Threaten Academic Freedom." "Confucius Institutes function as an arm of the Chinese state and are allowed to ignore academic freedom," AAUP wrote. 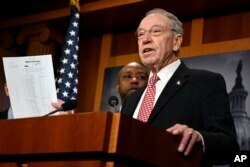 Grassley's correspondence cited recent convictions of Chinese nationals who have stolen research from American universities. "In simple terms, it's called cheating," Grassley wrote. "And it's only getting worse."